Champion Charter Bus is the top choice for group travel options in the Seattle area. Our services make traveling easy through Seattle and other Northwestern cities. Whether your group is traveling for a wedding, school trip, business event, or any other large adventure, Champion Charter Bus is here to assist in all travel needs. Call us today at 206-388-3358​ to get your free, personalized quote! Organizing group travel doesn’t have to be stressful, especially when renting through Champion Charter Bus. Our network of travel partners reaches across the West and allows us to provide groups with extensive transportation options of the highest quality. Along with Seattle, we service various other major cities in the region as well, including Portland, Sacramento, Las Vegas, San Francisco, and more. We have experience transporting groups of all sizes for various types of occasions. Large groups for weddings, sports events, or even school events will find a full-sized motorcoach to be comfortable and spacious. Accommodating up to 56 passengers, the full-sized buses we charter are modern, reliable and equipped with up-to-date safety features. The larger buses we charter include the options of premium amenities for optimal comfort. Choose from premium amenities like WiFi, climate-controlled interiors, on-board restrooms, spacious luggage bays, and more. Small-to-medium sized groups may find a compact minibus best for Seattle travels. Minibuses are perfect for private trips or even business travel, for groups of 18 passengers, 20 passengers or 25 passengers. Don’t worry about sacrificing comfort or amenities with minibuses-- these smaller vehicles provide plenty of space, comfort and optional amenities for travelers as well. Plan an outdoorsy private group trip or vacation with your own private motorcoach. Once known for its expansive stretches of evergreens, Seattle is now a booming metropolitan area that has managed to hold onto some historic greenery. The city still ranks among the top 10 states for the number of national forests and parks, making it a great destination for groups looking to explore the outdoors. Visit the metropolitan parks like Gas Works Park or Discovery Park, then take a trip outside the city to explore national parks like Olympic National Park or Mt. Baker-Snoqualmie National Forest. Enjoy the outdoor wonders in Seattle with your group and don’t worry about the stress of organizing transportation. Each rented charter bus comes with a professional driver to traverse the roads for your group, no matter the distance. Educators and chaperones looking to plan an educational trip into the heart of Seattle should look no further than Champion Charter Bus for travel needs. Our highest priority is to provide safe and enjoyable travels for all of our passengers. The buses we charter are fully equipped with modern safety features to keep even our smallest travelers safe during an educational outing. Take in the breathtaking view of the Seattle skyline while in the area. Visit the Space Needle, the Chihuly Garden and Glass exhibition, the Seattle Children’s Museum, or the Skyview Observatory while in the downtown area. Charter buses can include amenities beyond the standard yellow school bus-- WiFi and televisions with DVD players will keep the kids entertained throughout the entire trip. Seattle is home to a multitude of beautiful indoor and outdoor venues for events like weddings, corporate banquets, family reunions, and other large-scale events. 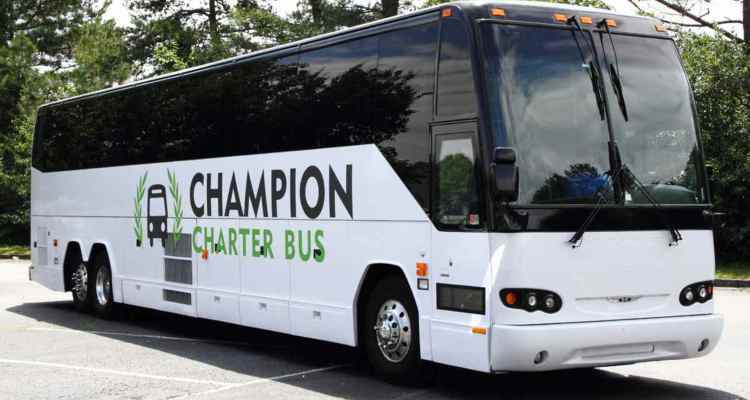 Choosing Champion Charter Bus ensures timely and efficient transportation services to venues across the city. Whether you’re hosting a huge wedding at the The Great Hall at Union Station or a large corporate event at the Seattle Marriott Riverfront, charter buses make an excellent choice for group transportation. The bride and groom won’t have to worry about how their guests will make it to the venue. Event coordinators for businesses can keep their minds on other important factors during a corporate event. Leave the transportation to us and your professional drivers. We’ll help coordinate a fleet of sleek buses for luxurious weddings and professional events. If your group is looking to travel outside of Seattle, rest assured that we have long-distance travel options to suit your destination. Explore new cities for business or leisure with a private charter bus. Hit Portland for a bachelor or bachelorette party, travel to the San Francisco area for a sports trip to see the Raiders or Golden State Warriors, or maybe even head to Las Vegas for an exciting group casino trip. The travel opportunities are endless when you choose Champion Charter Bus. Once you’re ready to book your group trip to Seattle, give us a call to start the reservation process! Call 206-388-3358 to speak with an experienced rental representative about your travel needs around Seattle. We’ll pair you with the perfect bus and driver to make your travels as smooth as possible.